Joni Mitchell is a Canadian musician, singer songwriter, and painter. 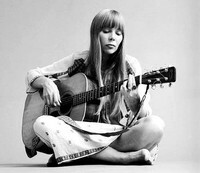 Allmusic said, "When the dust settles, Joni Mitchell may stand as the most important and influential female recording artist of the late 20th century", and Rolling Stone called her "one of the greatest songwriters ever". Her lyrics are noted for their developed poetics, addressing social and environmental ideals alongside personal feelings of romantic longing, confusion, disillusion, and joy. 2011 EU re-issue LP edition, pressed on 180gram VIRGIN VINYL LP - Her 1971 poetic masterpiece. Intimate, soul-searching & bittersweet, this is a seminal singer-songwriter album that should not be missing in any music lover's collection.